It rained or drizzled non-stop from 7AM on. It was windy. It was cold. On my agenda today was seven miles of trail Up Killington Mountain - a beautiful summit over 4200 feet high with panoramic 360 degree views. If I could get Up to Killington's summit today, I would consider the day a success. I didn't expect to enjoy it - not one bit of it - not for a minute. I just wanted to get Up, claim the summit, and get back out of the Nasty Weather. Well, I made it. 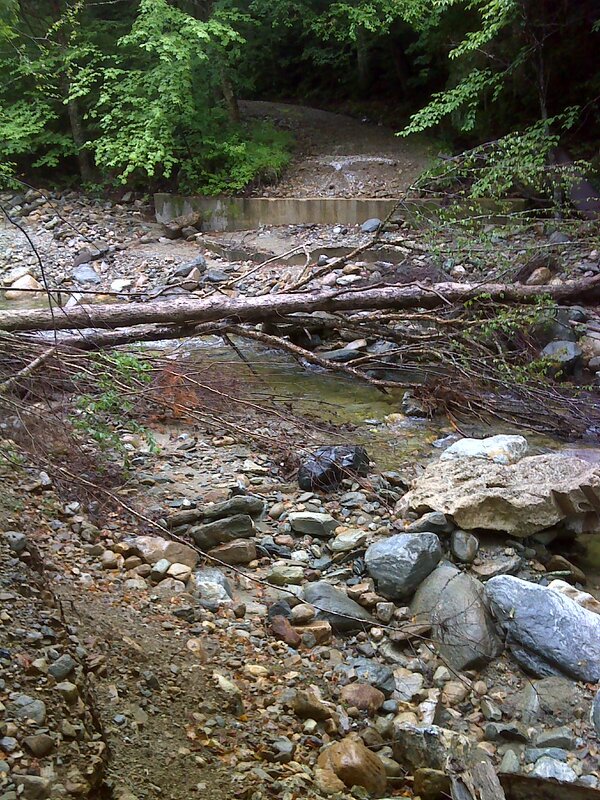 First I had to negotiate a 2.5 mile reroute due to Hurricane Irene. This 'bridge' was where the AT used to cross Sargent Brook. 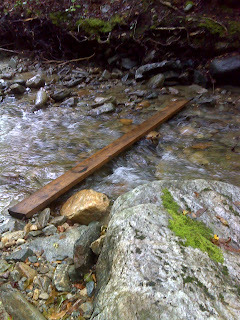 Bridge no more. Trail closed. 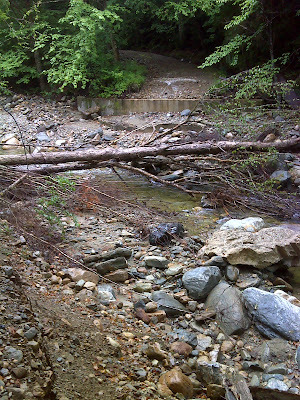 They warned that another bridge was out - I'd have to ford Robinson Brook before I got to the truly iconic 1928 Gov. 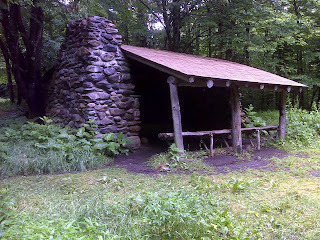 Clement Shelter. But 'they' were wrong. Somebody had installed a Snazzy new Footbridge, saving me the trouble of taking my shoes and socks off and wading through! What classic minimalist composition! What a profound statement of simplicity! Beyond Gov. Clement the trail got down to the business of going Up. Thank goodness. It stopped lollygagging around and went Up with no breaks or hesitations, just Up. Up and Up, until I got to Killington. Unfortunately once I got to the AT high point on Killington Mountain I faced a mile of Lollygagging around before I got to the real payoff - Cooper Lodge and the side trail to the summit. But then, for those who choose to take it, there is some *serious* Up. The 0.2 mile blue-blazed side trail to Killington Summit is like a skateboarder's half-pipe. It starts at the bottom with a gradual slope and just keeps getting steeper and steeper as you go Up. By the end it feels like a vertical wall. 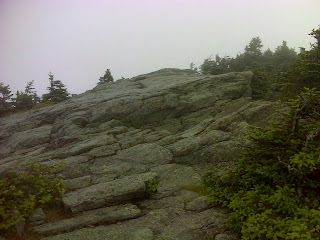 And it was a serious challenge with the rain falling, the wind howling, and the rocks as slick and wet as they get. But I made it Up without incident ... and then ... 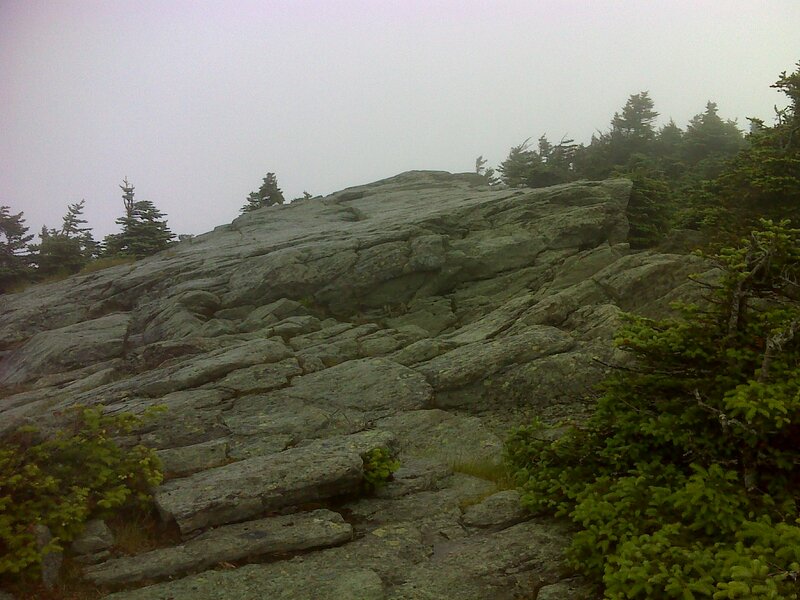 I fell taking a careless false step on the flat smooth rocks of the summit. Bloody shin to remember Killington by. Sheesh! Go figure. No views at the top either, of course ... unless the 'White Mountains' are actually gray, and extend from horizon to horizon and nadir to zenith. Not likely. A wall of fog. But ... Up accomplished. Time for down. I get to do the Up thing again tomorrow. Back to Killington from the north side. This is the first 4000' summit since the Shenandoahs. I'm hopeful that I'll get a view tomorrow. I've been lucky with most major vista points. Not sure I will be tomorrow, though. Will the weather be better? It could hardly be worse. But the forecast for tomorrow is for cloudy (meaning foggy Up there) and a 50% chance I'll be coming back down soaking wet again. Yes, today I got back 'home' soaked to the bone. Fortunately I had carried enough layers with me to keep me warm in spite of it all. And in spite of it all, I got my Up done.